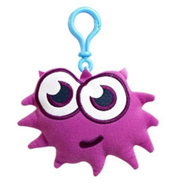 Well you have heard of adopting pets – well now you can adopt a monster! Thankfully they come in manageable sizes so they won’t become out of control. 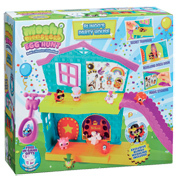 Moshi Monsters is a respected social networking online game for 7-12 year olds. Here children need to put their best nurturing skills into action to create impressive pet monsters. They need to adopt a Moshi and then love and care for it. 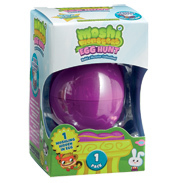 Here you will find some stuff to make the gaming experience more fun and help bring Moshis into the home (in a controlled fashion of course) with the delightful Moshi Collectible Figures. 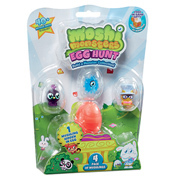 Solving puzzles and challenges earns Rox which are Moshi Monster rewards – basically Rox equals currency. It is then up to you how to spend these Rox – will it be on food, bedding, something to sit on, home décor, treats - or play toys even? There are a number of different shops selling all the kit you need to be a successful parent, and like all shops their stock changes daily. One of the best things about this game is that these puzzles are aimed to educate - whether its maths, spelling or other skills. Plus the better you are at the tests the more Rox you earn - a great incentive to learn - who says education can’t be fun! 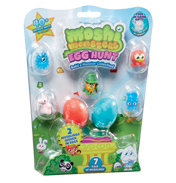 If you are relatively new to Moshi, the gift pack is a brilliant starter kit for Moshing. 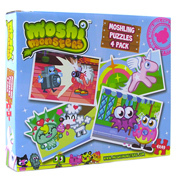 Plus as the pack also contains a 3 month membership card they make great presents for established Moshi parents. Normal membership on the Moshi website is free however as a member you have exclusive access to a number of members’ only benefits such as the Moshi Passport, access to Underground Disco, Gift Island, Moshling Zoo, The Port; ability to become a Super Moshi, and additional games and styling plus lots more- all very exciting! All of this happens at Monstro city - and the better the monster the more access you have in the city. Like a child, every monster needs care and attention - and they need to be kept entertained too which, like real life, can be hard. Health is as important as is happiness and if these two attributes are not kept on top of grumpiness will set in for your Moshi Monster or they may even become poorly (eeek!). You also need to be aware of what you’re are feeding them too - as for everyone a healthy diet is important - and too much of certain foods will have negative effects. Monsters are quite moody, temperamental creatures so watch out at all times for any mood changes which you need to deal with. You could try an easy entertainment technique - tickling (don’t go overboard though - think when someone tickles you it’s funny for a while then it gets really annoying and quite painful!). Bringing up a new monster isn't an easy task so it's a good job you have access to friends going through similar experiences. 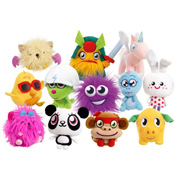 The better friend you are, and the better you look after your Moshi Monster, then the higher your Monstar rating will be. Simple. The website operates all of these tools, but now you can have a mini figure at home and also gain unique, secret passwords for more excitement online. 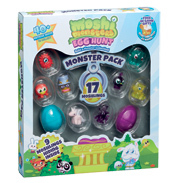 You may also wonder what a Moshling is - well it's easy - these are pets for your Moshi Monsters. Available virtually online around flowers in the wild and available here as mini figures for you to collect. Each one comes with Moshi codes too. Watch this space for forthcoming toy releases by Vivid Imaginations for soft toys, talking monsters, backpack buddies and more collectible figures in this Moshi Monster range.